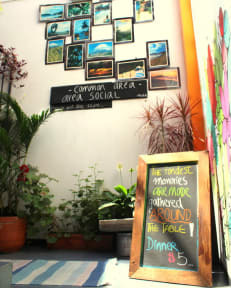 The best hostel in Quito! Great location, in the heart of historic center! Discover our renovated cozy common areas and try out our breakfast! Enjoy our fast and free wi-fi connection, kitchen facilities, daily activities and laundry service. Do you need help to plan your trip in Ecuador? We are what you need! 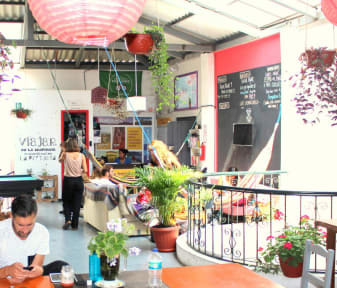 Fantastic hostel with extremely friendly and helpful staff, who will go out of their way to make your stay the best it can be. The in-house tattoo artist is very talented, and the pool table is one of the best you will see on your travels. Little noisy, but a great place with lovely staff! I stayed in the dorms and in a private room here and both were great. Staff let me check in super early which was nice seeing as I was tired after a night bus. Upstairs kitchen/ bar is a nice area to hang out and to cook. Pretty much no complaints for this place. Staff were really helpful too. Location is right next to the basilica which is good but a bit far from the main squares etc. Great hostel, comfy beds, hot showers and nice atmosphere. Would of liked the promoted events to take place though! Also disappointing one of the volunteers Anna decided to help herself to our milk in the fridge, always annoying if that happens but don’t expect it from the hostel staff! SUPER comfy beds and I loved the dorm with the en suite bathroom. My friend and I had the room to ourselves which was pure luck, but we had a very comfortable stay. The lockers were nice and big, and the kitchen was a great social area.